Start listing what needs to be done for each aspect. For example, for work – bills have to be paid, a new computer must be installed, meeting with investor and more. For home – attend parents-teachers conference, pay the nanny, do the grocery, etc. For personal – renew your passport, pay taxes, confirm dinner with ex-colleagues, etc. List down all the tasks that you need to do for each aspect in Daily Notes. You can list them by date, priority, category/ tab, etc. Focus on just one aspect for only a set time period. Set a time limit to tackle one aspect of your life, one at a time. For example, take care of your PERSONAL tasks first – pay bills online, exercise, follow-up on your personal emails. Then go to your HOME tasks – help your kids prepare for school, schedule a meeting with their teacher, schedule AC cleaning. Then go to your Work tasks, and so on and so forth. Set a deadline for each of your tasks in Daily Notes. Specify a due date and set a reminder. You can even schedule recurring tasks in Daily Notes, arranging them on a daily, weekly, fortnightly, monthly or even a yearly basis. Finish tasks in small, regular steps. Just focus on one aspect and move forward in incremental steps. Don’t try to finish all the tasks in under one aspect in a day. For example, if you have 10 tasks for HOME, 15 tasks for WORK, just finish 2-4 tasks for HOME then tackle 4-6 tasks for WORK and so on and so forth. Do this in a regular basis, finish tasks in small yet progressive steps. 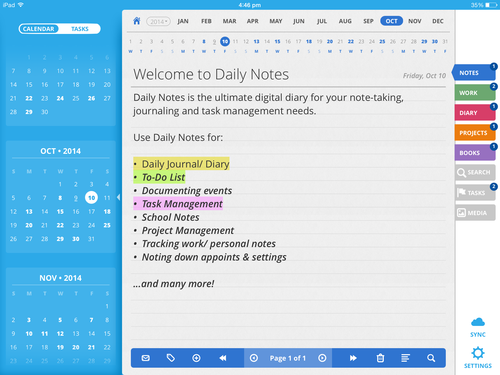 View the progress of your tasks in all aspects of your life in Daily Notes. Don’t allow yourself to be distracted by the other aspects in your life. If you allotted one hour of the day to a parents-teachers meeting, don’t get sidetracked by your work email. It defeats the purpose of being at the conference meeting. You are distracted by your email and you’re not 100% there , listening to the teachers talk about your kid’s progress. You have be both mentally and physically present in each and every one of the aspects of your life. That’s why you focus on just one task at a given time. Is this what needs to be done today? Am I wasting my time and energy doing this right now? How is improving my life? The act of isolating certain aspects of your life and just giving your focus on one, for a certain period of time, is one of the most effective ways of dealing and juggling multiple responsibilities. If know how to compartmentalize and give enough time on each are your life to make incremental progress and ignore that is not on your urgent list, it’ll be much easier for you to handle the stress of wearing multiple hats (mother/ father/ colleague/ boss/ son/ daughter/ friend, etc.) in your life.